I love coffee, so it’s easy for me to forget that I used to abhor the stuff. I started drinking it in my early 20s, as a way to cope with being a night owl in an early bird’s world. I had previously worked in the afternoons and evenings, but now I had my first “real” day job. I had to be alert before noon. I would slam a cup of coffee in the morning, much the way cowboys in old Westerns would slam a shot of whiskey before the bullet was dug out of their arm. I tempered the bitter taste with milk and sugar. Both were essential. I was not a milk OR sugar person. It was milk AND sugar. I had long let down my coffee-loving relatives. The drink was absolutely essential to any family gathering. My Grandma Viola’s coffee was the stuff of legends. It was strong by anyone’s standards, and she drank it straight up black. She was the only one to do so; everyone else needed at least a splash of milk. Coffee was a way for her to connect with others, as she served it with wisdom and advice, humor and sympathy. When my step dad joined the family, he joked that a spoon could stand straight up in a cup of her coffee. Growing up during the Great Depression, my Grandma knew how to make her coffee last. In the afternoons, she would stretch the morning’s grounds by sprinkling a spoonful of fresh grounds over the old ones. And then she’d fire up her percolator. These family gatherings took place in the late ‘80s, long before coffee culture took hold in Wisconsin. It was Folger’s vs Maxwell House, not Caribou vs Starbucks. I remember tasting coffee a few times at her table. I didn’t see the appeal. As a young teenager, I still favored sugary pop or juice. Grandma Viola would joke with me, “When you’re older and married, what will you do when your mother-in-law invites you to coffee? Will you ask for a glass of milk?” It was hard to imagine a time that I would tolerate, much less like, coffee. Or that I would ever be married. Or that Grandma Viola wouldn’t be here to see either happen. She died too young, still in her 60s, during a heart surgery that was meant to save her life. A decade after her death, each morning I would stumble into the kitchen of my first apartment. I was young and broke, and much of what I had was hand-me-downs, my coffee pot included. 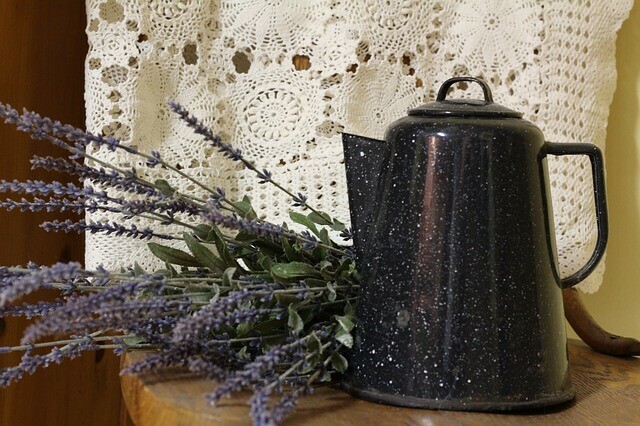 My grandmother’s percolator was given to me, after spending several years in a basement, collecting dust. I would do my morning routine of slamming a milk/sugar/coffee concoction, then head to the shower. This routine did not vary, until one day, I realized I had run out of sugar. I discovered coffee really wasn’t so bad with just milk. A Caribou Coffee opened in my office building, one of the first in this area. Coffee Fever had spread across the country. I was overwhelmed by the lengthy menu and Italian words. Eager cashiers explain the difference between a latte and macchiato. At this point, for me, straight coffee is still a coping mechanism, and not something to be enjoyed. For a long time, my usual workday order at Caribou was a raspberry white chocolate mocha. One morning after waking, I found myself slowly sipping my coffee, taking the mug into the bathroom with me. It’s actually more coffee than milk, and I have not slammed it. I might even be enjoying it. I catch a glimpse of myself in the mirror, holding the mug. Grief and adulthood intersect right there under my feet, on the cold tile floor. I’ve changed. I actually like coffee. I’m an adult. My grandma isn’t here. She’s gone, she will always be gone. That is never going to change. Grief is personal, so I can’t speak for everyone, but my grief never went away. It faded into the shadows and follows me, popping out when I least expect it. At different turning points in my life, I’ve paused and thought, “What would Grandma do?” Today, I am a long ways from my first apartment and hand-me-down coffee pots. I did get married. Ironically, my own mother-in-law didn’t drink or like coffee. Thanks to my grandma’s coffee pot and her memory, I know that when I sit by myself at the kitchen table with a mug of coffee, I’m actually not alone.